You can learn everything online if you know where to look. Nowadays it’s possible to start from zero and teach yourself enough to land a gig in the entertainment industry as a modeler, 3D animator, texture designer… pretty much anything. Pluralsight is one of the best sites for teaching yourself these practical skills without a college degree. 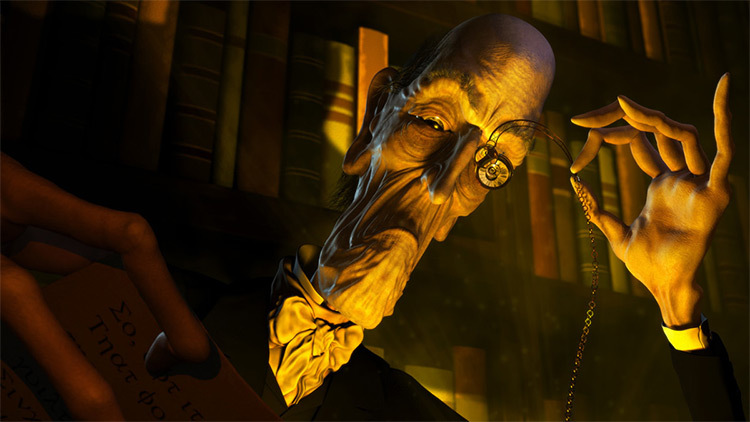 Most of the original modeling/animation courses were created by Digital Tutors. But these were moved into Pluralsight when the two companies merged in 2014. 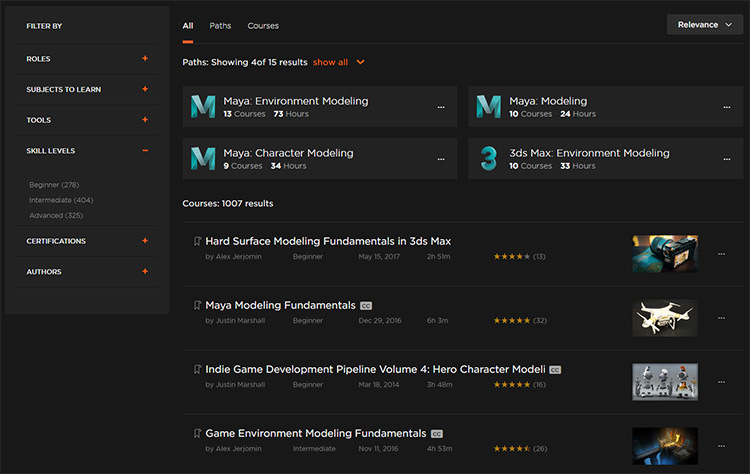 Now it’s the largest video library for anything you wanna learn: ZBrush, 3ds Max, digital painting in Photoshop or even general 3D animation. I signed up for Pluralsight’s free trial to check it out and share my thoughts in this review. I’ll summarize by saying that Pluralsight’s videos are fantastic, but probably not for everyone. Really it depends what you’re trying to learn. 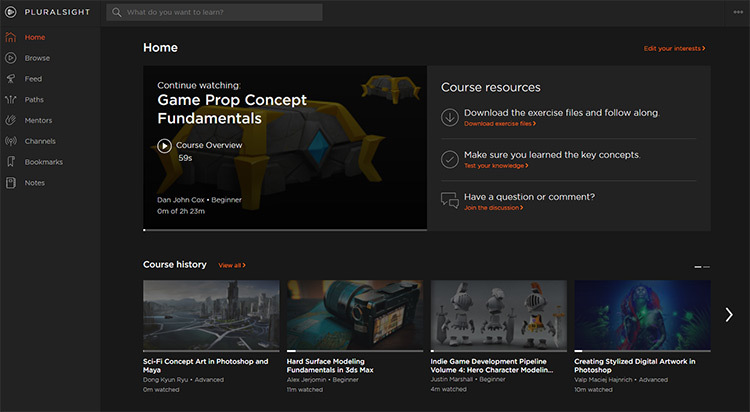 Pluralsight has a huge library of courses covering all skill levels and hundreds of topics related to the animation & video game industry. If that all sounds awesome then you’ll adore everything about this premium video library. With a Pluralsight subscription you pay a monthly fee to gain access to their entire course library. This library features 5,000+ courses with new ones added monthly. The monthly fee doesn’t increase so you’re not paying extra for the new content. I couldn’t possibly list every category but really, the library is huge. I’m specifically reviewing Pluralsight for its entertainment art courses like 3D work, concept art, digital rendering, and game design. Take a peek at the 3D/VFX category along with the Visual Communication and CG 101 course pages. If you’re considering Pluralsight for programming, web design, IT/technology, business or anything else, this review can still offer some insight. Most courses are produced the same way offering the same video quality and user experience. My focus for this review is mostly on the creative courses. And just browsing through the site you’ll find a lot of them. Even a 5 minute search shows Pluralsight has a massive course library on creative arts stuff. People looking to break into the games industry can literally train themselves for any job from start-to-finish using Pluralsight. 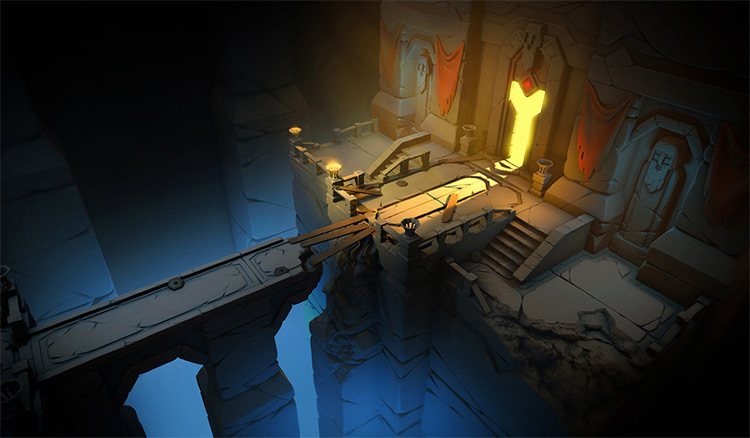 Even beyond the simple newbie stuff you’ll find courses on making complex game art that can help you develop work for a serious portfolio. Some of their courses date back a few years but most information is still useful. You just have to put in the time and make an effort outside Pluralsight’s videos to make sure you’re practicing enough. Each course typically includes exercise files you can use for practicing as well. These exercise files help you follow along with the instructor’s lessons through the course. And with one account you have full access to all videos, all exercise files, just for one monthly fee. You can sign up to Pluralsight for a free trial that runs for 10 days and offer 200 minutes of free video lessons. This means you can watch about 3 hours of video before you have to upgrade your plan(not required & you can cancel anytime). I do wish the free trial offered a little more time. But it’s enough to take a look around and see what you think. You should be able to tell right away whether it’s something you’d use or not. One thing to note: when you sign up you’ll need to either connect your PayPal account or add your credit card. You will not be charged during the 10-day trial, but after 10 days it will auto-renew unless you cancel first. So just keep that in mind while signing up. Inside the user dashboard you can search for courses or browse by topic. Since Pluralsight merged with Digital Tutors there are tons of categories with courses ranging from programming to creative design work. For example, aspiring pro concept artists may look into Pluralsight’s Photoshop Digital Painting path with a handful of courses on practical concept art & illustration. 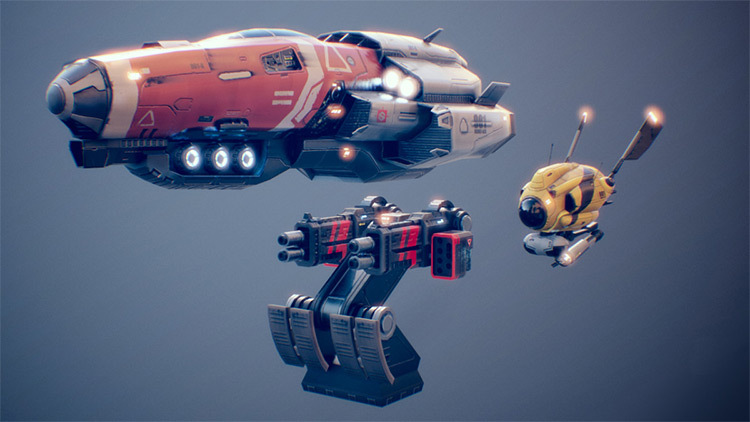 They also have more technical paths for learning software like ZBrush or for diving into detailed topics like video game environment modeling. These pre-designed paths are great because they’re curated by the Pluralsight staff to offer the smoothest learning curve. You can always browse courses individually but paths make the learning process much simpler—especially when you don’t know what you need to learn. But let’s talk more about the dashboard experience. 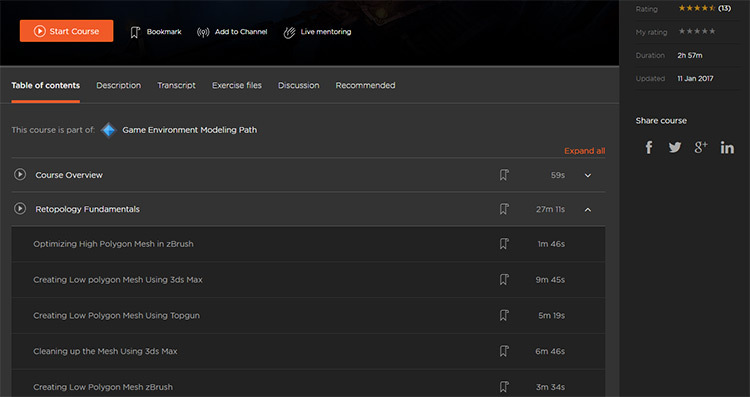 Once you select a course you’ll be directed to a player page with the full course playlist on the right-hand side. All videos stream right inside your browser and they’re pretty big. You can adjust the video quality(high/med/low) if the stream is taking too long or if the video is too pixelated. But the playlist interface is stupid simple. Non-technical people can easily work through Pluralsight’s videos with ease. You can mark which videos you’ve completed and even leave notes on certain videos. This way you can even keep your own digital study notebook as you work through complex topics. Super impressed with the player quality. It’s no doubt the best premium dashboard for streaming videos that I’ve ever used. Once you’re logged into your account each course page includes links to a transcript for all videos along with all the downloadable exercise files. Granted not every course has exercise files. But most do. They’re all labeled based on the chapter & video number so you know which exercise files relate to which video. Easy to download right to your computer with one click. However you cannot download the video files to your PC. This makes sense because Pluralsight is a monthly subscription platform, which means you only have access so long as you renew the subscription. Other courses I’ve reviewed like Proko and Bloop Animation let you purchase courses for a one-time fee. You own those courses entirely and can download the videos as you wish. But no other course library can compete with Pluralsight+Digital Tutors. It is absolutely massive and it’s full of rare techniques for mastering game design, animation, modeling, sculpting, rendering, painting… there’s a lot. If you aren’t sure how to use the Pluralsight backend dashboard you can always look through their how-to resource page. It’s full of guided videos and support articles answering the most common questions from new users. Really though you shouldn’t have any trouble with the user dashboard. I give it an A+ rating for ease of use, consistency, and a great search feature. Every course is taught by a professional with years of experience in the course topic. Most software courses feature industry veterans who’ve worked in-studio or as freelancers for big entertainment brands. When you’re browsing a course page you can actually click the instructor’s name to view their full profile. This offers a rundown of their top skills, all their Pluralsight courses, and a bio detailing their career & what qualifies them to teach. You’ll also find course ratings submitted by people who took the course in the past. If you’re hesitant to start a course these ratings will definitely help you find the best quality. If you’re concerned about finding the best courses to match your needs just look through the Pluralsight paths. Each path lists a bunch of courses hand-picked for quality, length of content, and teaching style(from beginner to advanced). And by using Pluralsight Channels you can even develop your own “paths” from scratch. Channels work like playlists so you can browse through courses on specific topics and design your own learning paths from scratch. You can browse courses by difficulty and even organize different channels based on your learning requirements. Doesn’t matter if you’re starting with a topic from the very beginning or trying to learn more advanced techniques. I’d guarantee you’ll find a course that’ll help you pick up some new tricks. 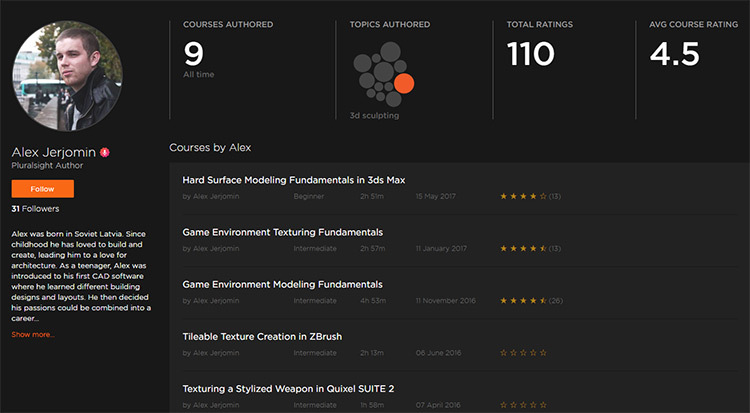 Each course prominently displays the difficulty, the total video runtime, and the average rating in the sidebar. It also features the course’s original release date so you can decide if the materials are too outdated. Now onto the video quality: it’s awesome. HD videos with clear sound and great narration. These instructors have to be vetted by Pluralsight before they can teach a course. And they have to follow certain rules put forth by Pluralsight to ensure that all videos have a similar feeling. Since most of these tutorials deal with software and technology you’ll typically watch the instructor perform actions on their computer via screen recording. The best way to learn is to work through these lessons on your computer in real time so you can follow along step-by-step to learn as you go. Each course includes a .zip archive with all the exercise files for the entire course. Just one click and you have everything you need to work through the lessons. Some courses even have practice quizzes to test your knowledge. These are useful to see how much you’ve retained from the videos, and to identify problem areas where you may be struggling. If you’re in the middle of a lesson and wanna call it a day you can bookmark exactly where you leave off. When you log in for your next practice session you can pick up the video from that bookmark, even down to the minute & second. Pretty cool! With so much variety to pick from you’re bound to find a few courses that’ll skyrocket your skills to the next level. One cool feature unique to Pluralsight is their online mentoring. Pluralsight offers direct connections to professionals on dozens of topics where you can ask questions, gather critiques, and chat one-on-one with industry veterans. Unfortunately for aspiring artists/animators, there aren’t a ton of mentors in those categories. Most of the mentors focus on IT & technical subjects like programming. But you can find a few mentors for complex industry software like Unity and Maya. Mentorship is not part of the usual pricing so it does cost extra. Typically paid by the minute which can get pricey, but it’s invaluable for getting a pro to look over your work and offer critiques. If you’re struggling with a topic and just cannot figure out how to do something then you’ll be reliant on the Internet or you’ll need to play around on your own. You can’t ask a video how to do something. But you can ask a mentor via video chat. 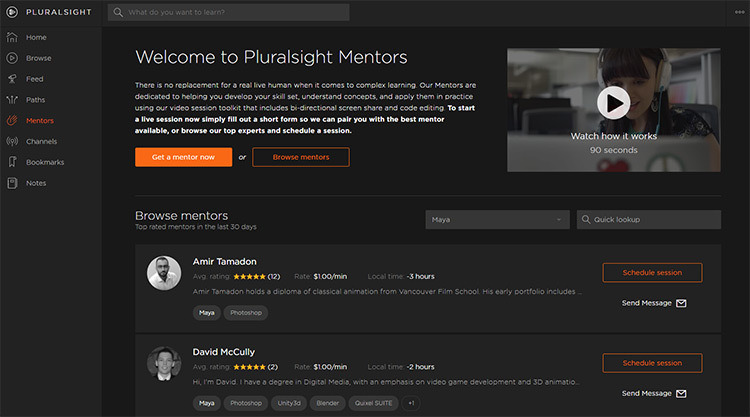 The Pluralsight mentoring section is self-contained so you have full access to everything right from your dashboard. You can schedule sessions and review your chat logs to go over things that you may forget. This mentoring feature is pretty cool and certainly not something I’ve seen in other premium learning sites. Granted you may not have a need for this right away. But some of these mentors are incredibly skilled. Looking over some animation mentors I’m seeing people with 10+ years of industry experience with work history including Pixar and Blue Sky Studios. This feature won’t make or break your decision to join Pluralsight. But it’s a sweet bonus that feels like an optional one-on-one teaching module alongside the premium courses. Check out this promo video to learn more about mentoring. Anyone can try Pluralsight for a 10-day free trial right away. This trial does require a credit card(or PayPal account) but you won’t be charged until the 10 days are up. You can always cancel early to never be charged a penny. Although for complete access to Pluralsight you have two pricing options: monthly or yearly. If you do monthly it’s $29/mo. If you do yearly it’s $299 for a full 12-month account with no recurring fees until the following year. This means if you go with the yearly fee you’ll save about $50 over the whole year. Not really a huge deal to be honest. But it’s the better choice for anyone who knows they’ll be using Pluralsight for at least a year. You can also do a pay-as-needed setup where you sign up for a monthly account, study the courses you want, then cancel until you need it again. This way you’re only paying when you need it and don’t get stuck with a consistent monthly fee. The pricing page has more info about these two plans along with links for the 10-day trial. Naturally I recommend doing the free trial first to see if you like it. I mentioned in the beginning of this review how Pluralsight is not going to help everyone. It’s a very specific library of videos and it may not have courses on certain things you wanna learn. For example, traditional animation and art fundamentals are just not covered on Pluralsight. But for the topics you can find, those courses are beyond valuable. Full access for $29/mo is totally reasonable for everything you get. And once your trial is up you can always subscribe for just the months you need. Cancel any time, resubscribe any time, and stretch your budget to make the most of Pluralsight. Considering the size and quality of courses in Pluralsight’s library I’m beyond impressed with their service. The icing on the cake is their fantastic user dashboard, their frequent release of new courses, and their tailored paths you can study from(or even use in your own self-teaching routine). I can’t comment on much beyond the CG & animation courses. But the video quality was fantastic with very clear narration and easy-to-follow exercises. 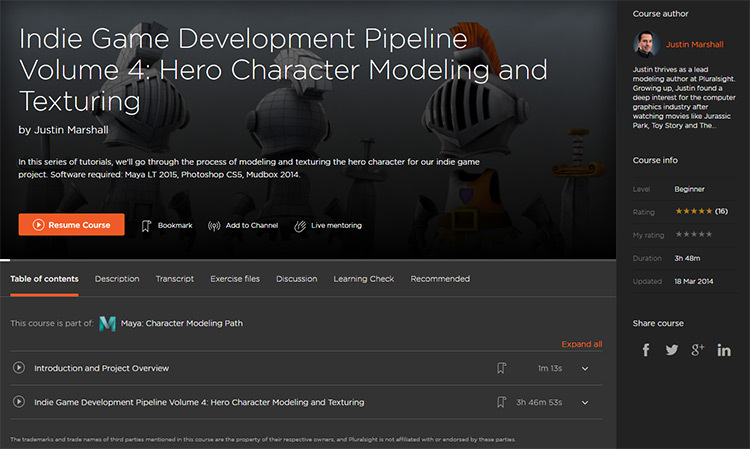 I absolutely recommend joining Pluralsight if you want to learn and even go pro in any of these areas: 3D animation, modeling, sculpting, game design, character design and/or rendering concept art for movies & video games. If you can dedicate a few hours to practicing every day you can easily make up for the $29/mo fee in just one month. Let’s say you practice 1 hour a day every day for the entire month. That means your Pluralsight subscription would average out to less than $1/hour for your training(30hrs a month at $29). If you can practice more than 1hr/day you’ll be learning from premium HD videos and basically paying peanuts! Visit the pricing page and join for a 10-day free trial to give it a test run(look under the signup buttons for the link “start a free trial”). Pluralsight is one of the best video libraries for teaching yourself practical skills used in the entertainment industry. You can take yourself from novice to pro with just these courses and a bit of old-fashioned elbow grease.